Advanced Discounts allow for flexible configuration giving you a lot of control over how you manage discounts in your store. Advanced Discounts must be created and managed on the Bindo Dashboard. You can create discounts based on rules (aka "Triggers") which lead to an outcome, or set of outcomes. An example of a discount trigger is "Order Total > 100". This trigger means that any time an order total is greater than $100.00 the discount will be triggered. The outcome for this trigger is configured separately - if the desired outcome is $15.00 off the order total, then that outcome should be added. The result in this example would be $15.00 off any order over $100.00. This is a relatively simple example since it involves a single trigger and a single outcome. There are many options for discount triggers and they can be combined to create highly targeted discounts. For example one could add a second trigger using Day of the Week to the above discount, adding a trigger where "Day of the Week = Monday". In the updated example with two triggers ("Order Total > 100", "Day of the Week = Monday") the $15.00 off will only be applied if the criteria for both triggers are met. With this update the discount will only be applied on Monday. Product(s) - Choose a specific product or group of products (the discount can only apply when one of the selected products is purchased). For a discount on an individual product, the product should be added to both the Trigger (the product must be purchased to trigger the discount) and the Outcome (a discount will be applied on the selected product). Department(s) - Choose a specific department or group of departments that will trigger the discount. Order Total - The discount will be triggered only if the Order Total meets the defined criteria (ie greater than 100). Product Total - The discount will be triggered only if the product total meets the defined criteria. Product Total may equal Order Total in many scenarios, but Order Total also includes things like Miscellaneous Charges (added when the "Add Charge" button is used), or Additional Fees. For the Order Total and Product Total triggers you may set these up with a range of criteria as shown in the below image. The choice "ANY" indicates that this discount will be triggered no matter what the order/product total is. "Equal to", ">", ">=", "<", and "<=" indicates that the discount will apply only when the order/product total qualifies based on the criteria. Customer(s) - Select specific customers that will trigger the the discount (or if you select "All Except Selected Customers" the the discount will be triggered any time a customer is added to a sale that is not on the selected list). Click on the relevant check mark and then the field next to the check mark to select Customers (or excluded customers). In the below image specific customers are selected for which this discount will apply. Membership Level - Select a Membership Level (or multiple) which will trigger the discount, or which should be excluded from receiving the discount. Click on the relevant check mark and then the field next to the check mark to select the Membership Level(s). Day of the Week - Select a specific day or group of days that will trigger the should apply. In the below image the discount is set to apply on Weekends (Sat & Sun) only. 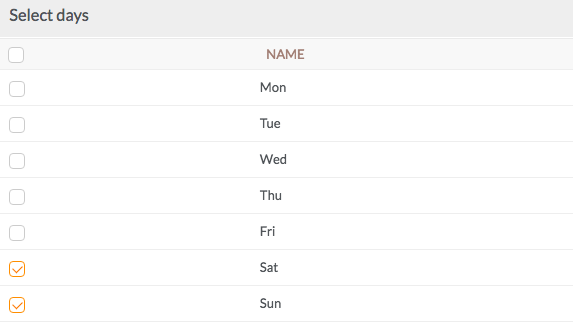 Date Range (to the minute) - Select a starting and ending day, hour and minute for your discount. You may add multiple date ranges for a discount. In the below image the discount is set to apply only from 6:00 PM to 7:30 PM during the month of October 2016. I could also make the discount apply for January 2017 by clicking on the "Add Another Date Range" button and including a second date range with Start date: 2017-01-01 and End data: 2017-01-31. Channel - Select a Channel on which the discount should be applied, choose from "POS", "Web", "Mobile", or "Marketplace". If you do not select a Channel the Discount will apply across all. Order Type aka Procurement Method (Applies for Restaurant POS Only) - Select a Procurement Method for which the discount should be applied, choose from "Pick Up", "Delivery", or "Dine in". If you do not select a Method the Discount will apply across all. Party Size (Applies for Restaurant POS only): Set a rule for party size, such as "> 6" which will apply the discount on tables with more than six diners. Stackability: Create stackability rules to define whether the discount can be applied in conjunction with other discounts. A stackable discount can be applied to a sale along with another stackable discount. "Stackable to All" indicates that the discount can be added along with other discounts. "Non-Stackable to All" indicates that the discount cannot be combined with any other discounts and may not be added to the sale in conjunction with other discounts. You may also select specific discounts with which an Advanced Discount can be stacked or will be prevented from being stacked with. Note: Stackability applies only for Advanced Discounts in relation to other Advanced Discounts. Stackability rules cannot apply for Advanced Discounts in conjunction with Regular or Mix & Match Discounts. Other Settings: Several other settings can be configured in the Settings section, including the ability to "Apply Discount Automatically". Make sure to check "Apply Discount Automatically" if you want the discount to be applied to sales which meet your criteria without being added manually or via discount code. Select an Outcome or set a Tier for your discount to define the percentage or amount to be discounted when the criteria you defined in the Discount Triggers section is met. For a straightforward outcome with a single percentage of dollar amount off set the Outcome Option to "Off Entire Order" and select "Percentage" for a percent off, or "Absolute" for a flat amount off. Additional Outcomes and Tiers can be added to create discounts on specific products or departments. Add a Code to your Advanced Discount to associate the discount with a specific barcode. Scan the barcode on the register screen to apply a specific discount. Note that if you check "Apply Discount Automatically" under "Settings" on the Advanced Discount page the discount will be applied automatically whenever the order data meets the Discount criteria. If you leave "Apply Discount Automatically" unchecked the discount can be applied by scanning a barcode that matches the Discount Code.